News & Trends> Product Trends > Industrial machines and equipment > Plasma Treatment Systems serve semiconductor applications. Plasma Treatment Systems serve semiconductor applications. Concord, California, USA -- Nordson MARCH, a Nordson company (NASDAQ: NDSN), a global leader in plasma processing technology, announces its new SPHERE™ Series plasma systems for wafer-level and 3D packaging applications. Based on Nordson MARCH's TRAK™ Series, the new series consists of the TrophoSPHERE™ and StratoSPHERE™ plasma treatment systems. The systems perform descum, ashing (photoresist/polymer stripping), dielectric etch, wafer bumping, organic contamination removal, and wafer destress. Both systems support automated handling and processing of round or square wafers and can process thin wafers with or without a carrier, depending upon the wafer thickness. The SPHERE Series models are differentiated by the size of their chambers. The TropoSPHERE system has the smallest chamber. It is designed for high-throughput processing of semiconductor wafers and other flat substrates in sizes ranging from 76 mm (3 in.) to 200 mm (8 in.) in diameter for wafers held in open cassettes. The StratoSPHERE plasma system handles semiconductor wafers up to 300 mm (12 in.) in diameter. Both series utilize a patented plasma chamber design that provides exceptional etch uniformity and process repeatability. The control architecture enables short plasma cycle times with very low overhead, ensuring that throughput is maximized and cost of ownership is minimized. "Nordson MARCH's SPHERE Series is an easy way to eliminate problems caused by contaminants that result from the semiconductor manufacturing process," said Jonathan Doan, director of marketing, Nordson MARCH. "Our plasma treatment can be used for both wafer cleaning and a variety of etching, ashing, and descum steps along with contamination removal, surface roughening, increasing wettability, and enhancing bonding and adhesion strength. I invite SEMICON West attendees to meet with our technical experts at the Nordson MARCH booth #5743 to discuss how plasma treatment can improve the quality and success of their manufacturing process and products." Nordson MARCH technical experts will be in booth #5743 at SEMICON West 2015, held in the Moscone Convention Center, San Francisco, CA from July 14-16, to discuss your applications. Nordson MARCH is the global leader in plasma processing technology for the semiconductor, printed circuit board (PCB), microelectronics, and medical & life science device manufacturing industries. Nordson MARCH has offices and applications laboratories worldwide, including California, Europe, Singapore, China, Japan, Korea and Taiwan. With over 25 years of continuous innovation, Nordson MARCH designs and manufactures a complete line of award-winning and patented plasma processing systems. An expert staff of scientists and engineers is available to assist in the development of plasma processes that improve product reliability and increase production yields. Nordson Corporation delivers precision technology solutions that help customers succeed worldwide. Precision dispensing of adhesives, coatings, sealants, biomaterials, and other fluids, plastic extrusion and injection molding, electronics testing and inspecting, and surface preparation are supported by applications expertise and direct global support. Nordson serves consumer non-durable, durable and high-technology markets, specializing in packaging, nonwovens, electronics, medical, energy, transportation, construction, and product assembly. Founded in 1954, headquartered in Westlake, Ohio, USA, Nordson has operations and support offices in 30+ countries. 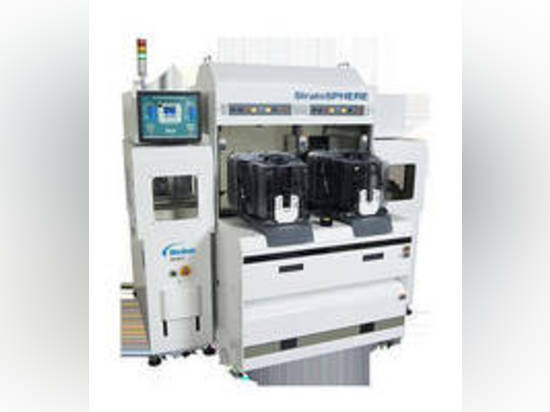 Targeting wafer-level and 3D packaging applications, TrophoSPHERE™ and StratoSPHERE™ support automated handling and processing of round or square wafers and perform descum, ashing, dielectric etch, wafer bumping, organic contamination removal, and wafer destress. 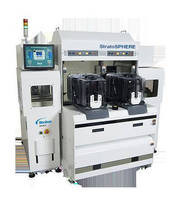 Troposphere is designed for high-throughput processing of semiconductor wafers and other flat substrates in sizes from 3–8 in. dia for wafers held in open cassettes, while StratoSPHERE handles semiconductor wafers up to 12 in. dia.